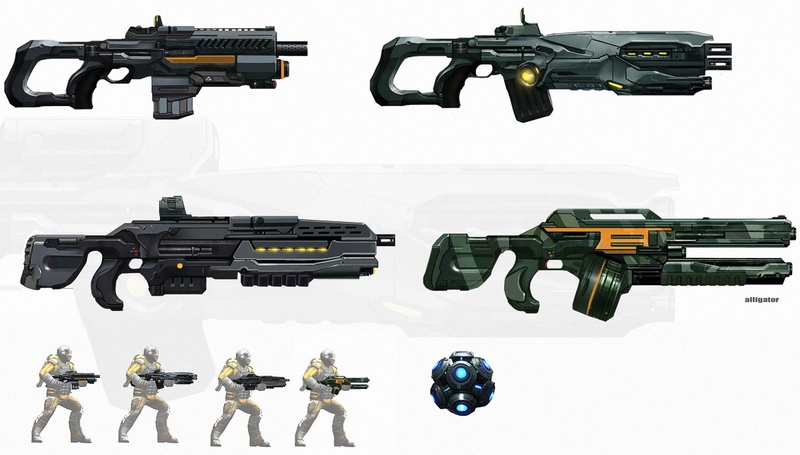 The Assault Rifles is one of Weapons type in the Evolution: Battle for Utopia game. Assault Rifles have a high rate of fire, large magazines, and are effective at any range. Also, their ammo is a relative bargain compared to Shotguns and Machine Guns. This makes Assault Rifles a good choice for most combat situations. – Regular Damage. Good for unarmored targets (100% damage), but totally useless for armored (0%). This type of damage is Most common among Assault Rifles (4 of 8). – Energy Damage. Good for unarmored targets (100% damage) and useful for armored (50%). This type of damage is also common for Assault Rifles (3 of 8). Dominion AR is the best Assault Rifle in the game. – Incendiary Damage. Excellent for unarmored targets (130% damage), but totally useless for armored (0%). This type of damage has only one (premium) Assault Rifle (Dragon). – Acid Damage. Good for unarmored targets (100% damage) and just brilliant for armored (130%). No Assault Rifle with this type of damage in the game yet. Unlike Pistols, all Assault Rifles have the same reload slider: , same rate of fire and reload time. Assault Rifles are the only weapons having an available Stasis Shot add-on. Why there is no Acid Gun for AR? I’m pretty early on in the game (Lv. 21) and have used the AR very little so far. Up until now I’ve been using pistols and a shotgun. Just got the Avenger AR, and already have the acid pistol. I curious, what’s the best strategy for using ARs? As your primary weapon and shooting them from a distance, eating through your ammo? Or do you just use it when the enemies move right up? Plus there’s always a few armored guys in any fight, and you don’t want to wait until THEY move up close, so seems you’d still be using some kind of armor killing pistol most of the time (i.e. long distance fighting). The problem is, I’m finding my pistols too weak for some fights. Steve, first i’d let you know i’m newbier than you, just got to Lv12 and still relies on my upgraded Strombreaker & still no upgrade on the Fighter AR. For now i’m thinking to rely on the Pistol as much as possible because 1st it does the same Regular Damage as the AR, and 2nd its ammo is FREE.